The banking industry worldwide is undergoing an accelerated pace of change as the result of technological, regulatory and economic developments. Nonetheless, there is a solid underpinning to the business—based on trust and partnership—that has held steady for centuries. Strong relationships with clients and good risk management are the keys to success. In a rapidly changing world order, risk managers have to take more on. But as these awards demonstrate, even in the riskiest regions, banks that pay close attention to their asset quality and their clients’ businesses can be very successful. They also can make enormous contributions to the development of economies in which they operate, from lending to small and medium enterprises to funding huge infrastructure projects. In this, our 24th annual survey, Global Finance has identified the best banks in more than 150 countries and eight regions. The winners are not necessarily the biggest banks, but rather, the best—those with the qualities that corporations should look for when choosing a bank. They are banks that attended carefully to their customers’ needs in difficult markets and accomplished better results while laying the foundations for future success. All selections were made by the editors of Global Finance after extensive consultations with corporate financial executives, bankers and banking consultants, and analysts throughout the world. Banks were invited to submit entries supporting their selection. Our selection criteria include growth in assets, profitability, strategic relationships, customer service, competitive pricing, and innovative products. 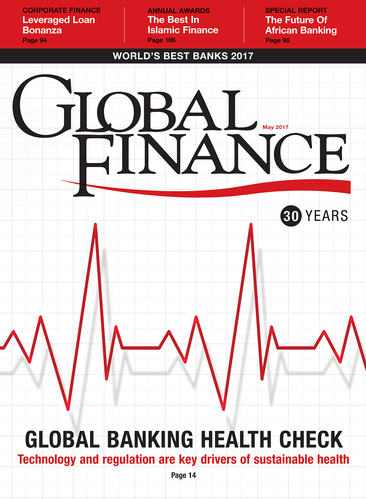 In addition, editors conducted a poll of Global Finance’s corporate readership to increase the accuracy and reliability of the results.